After a hiatus, your Grandparents Club is fixin' to get re-energized, organized and focused on supporting the HRA mission and vision. Look for us at Grandparents Day in October. While we're reorganizing, the basic idea remains the same. Holy Rosary Academy has been extremely successful in attracting students and delivering excellence in education as recognized in its designation as a Department of Education 2013 Blue Ribbon School. However, an aging campus and facilities has created a drain on resources for critical upgrades and repairs that are essential to maintain a safe, healthy and effective environment to carry out its mission. While many grandparents of students support HRA in a variety of ways, there is perhaps an opportunity to more effectively tap into the tremendous resource through an organizational and educational effort directed specifically to this group. If the needs of the Academy are more well-known by this group, it is likely they would gladly join in support of them, perhaps in more significant ways. The Idea is to develop an organization of grandparents of current HRA students to inform them on the needs of the Academy, and enlist them in support of addressing those needs, developing a Grandparents support network to address current and future needs of the Academy. Ham It Up for HRA! Ham It Up for HRA will begin its second annual fund-raising effort to benefit the remaining window replacement project in the library. Last year, we raised over $600 in our first effort to the window replacement project. Beginning NOW, we are again offering an opportunity for you to purchase HoneyBaked Hams gift cards for your holiday and any-occasion giving -- or a gift to yourself!! Who doesn't love HoneyBaked Hams? These gift cards can also be used to purchase other items from their stores or online. Great Gifts of Great "Eats"
For every gift card purchased through this program, 20% of the sales will go directly back to Holy Rosary Academy to help fund projects and programs that will support and further enhance their delivery of award-winning education to students! 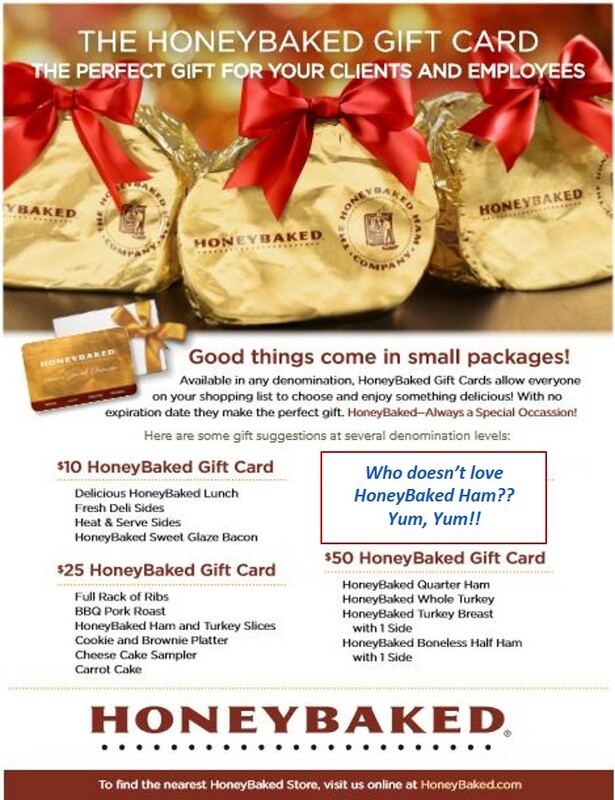 We have included a link below to place your order for your HoneyBaked Ham gift cards and the products your gift cards can purchase. Just order online at our dedicated website address and your gift cards will be mailed to you at your home address, or if you wish, emailed to you. That’s all you need to do! So join us! Let’s all “Ham It Up” for HRA! We are the formations stage, and we are totally open to any and all ideas. Do you have some others? We hope you’ll share them. Email Lois Matisak or call at 615-476-6291. Watch for updates here and in an upcoming Grandparents Club NEWS.